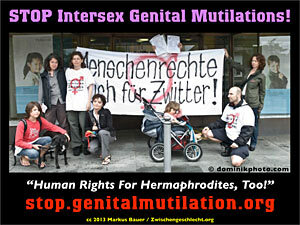 ‘Boston ’96 was a PROTEST!’ Happy 10th Intersex Awareness Day 2013! Today, for the 10th time Intersex People, Survivors, Partners, Families, Friends and Allies around the globe celebrate Intersex Awareness Day, commemorating the very first INTERSEX PROTEST in Boston in 1996 against the Annual Convention of the American Academy of Padiatrics (AAP), and in support of now 20 Years of Organised Struggle to End INTERSEX GENITAL MUTILATIONS. When was the last time YOU talked or wrote about INTERSEX PROTESTS? When was the last time YOU gave credit to those facilitating the protests? When was the last time YOU talked or wrote about IGM? When was the last time YOU named names of doctors and clinics? When was the last time YOU participated in an INTERSEX PROTEST? and today’s 17 Years of Peaceful Intersex Protests! Be informed – Take part in ending IGM!